A general rule of thumb when deciding what socks to wear is that your socks should be the same shade or a shade darker than your trousers. 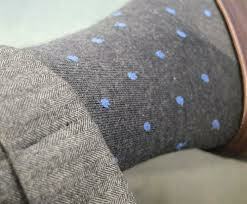 For example, with blue trousers, you can opt for navy blue socks, and with grey trousers, go for a charcoal grey. The exception to this rule (partially) is that with brown pants you generally want your socks to be darker than your shoes. As is the case with matching patterns for ties that I have outlined in earlier articles, if your trousers are striped, match the color of your socks with the less dominant stripe. For example, a pair of pants with a less dominant grey stripe would go well with grey socks. 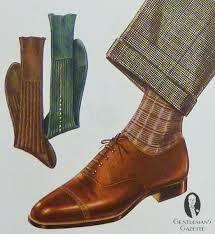 If your socks are patterned, the dominant color of your socks should match your trousers. So, argyle socks with a dominant navy blue would match up well with navy trousers! Check out some our favorite ties at The Dark Knot! Thank you! I am glad you find our content useful! Please let us know if you have any further content suggestions! Thank you for your interest in our content!